Now that I am home, let's catch up. If you haven't already read part 1 of my Wise Traditions trip, click here for that. I'm going to pick up now where that one left off — Friday evening. Friday's dinner was probably my favorite. 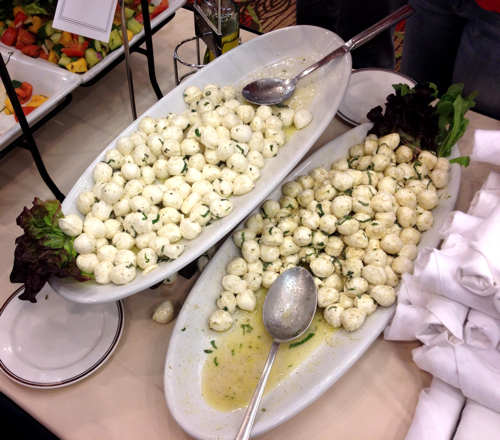 Mozzarella cheese balls marinated in olive oil. Rounded out with sausages, kraut and potato chips fried in lard. 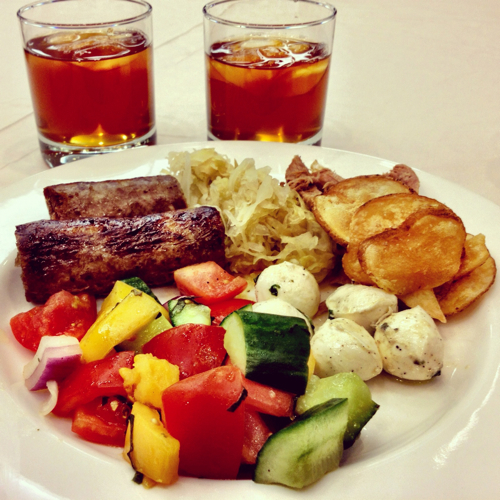 The tea at each meal was an iced rooibos. So good! 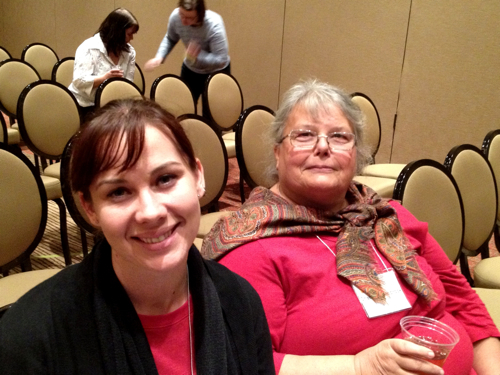 Friday evening's bloggers' panel was fun and informative. Moderator (and blogger): David Grumpert of The Complete Patient. Bloggers: Denise Minger of Raw Food SOS, Kristen Michaelis of Food Renegade, Dr. Jill Tieman of Real Food Forager, Kimberly Hartke of Hartkeisonline.com, and Matt Stone of 180 Degree Health. I watched the bloggers' panel with Jami from Eat Nourishing (a free real food recipe sharing site) and Charity of Health Alchemy Kitchen. The audience was light — but then again, there were four other options of what to see, including a movie “The Greater Good” on vaccines. 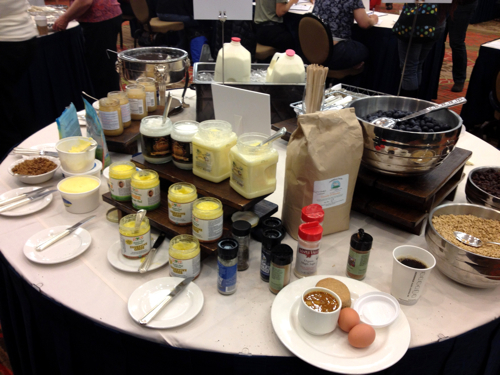 Come Saturday morning, we ate again at the FTCLDF breakfast — another delicious smorgasbord of yogurt or oatmeal with all the fixins'. 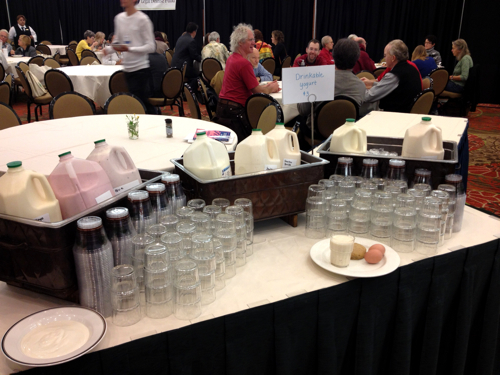 Plus they had biscuits and gravy, hard-boiled eggs, assorted muffins, fruit. You just went through and picked what you wanted and then fixed it all up. This is the fixins' table: milk, cream, ghee, butter, honey, coconut oil, pre-soaked oats, fresh blueberries, dried fruit and probably more I can't remember! The drinks were incredible. You could choose drinkable yogurt in many flavors. 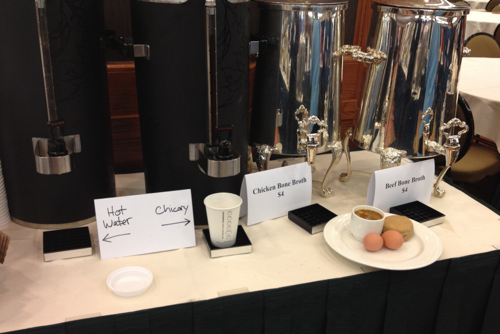 Or… chicken or beef broth, chicory “coffee” or hot water for tea. I drank chicory coffee with honey and cream each morning. 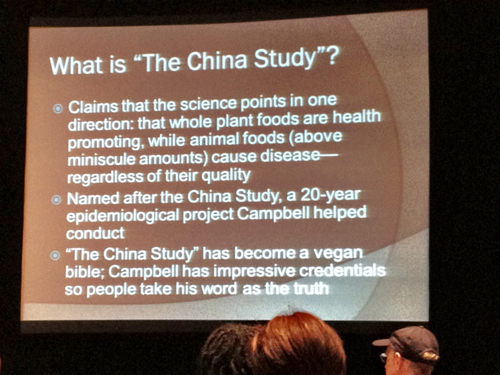 The most popular session of Saturday was probably Denise Minger's mythbusting presentation on The China Study. She was really, really funny… and real. If you have the opportunity to get the recordings, be sure to listen to this one. 🙂 These two slides from her presentation sum up what The China Study is and then the main arguments she made to debunk it. 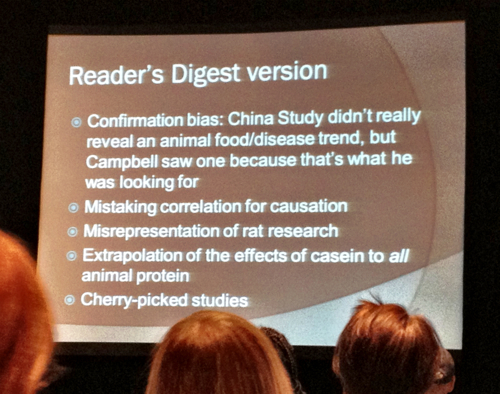 Visit her blog for the whole scoop on why The China Study is bad science. Saturday's lunch was a great blessing to me! GNOWFGLINS friends (and two husbands even!) joined me for lunch. A few people couldn't find us — not surprising as the conference dining room was huge and packed. Top row, left to right: Claudia Keel — WAPF chapter leader in New York (who won the grand prize trip to Alaska in the FTCLDF raffle), Tami, me, and Emily. Bottom row, left to right: Joy from A Well Armed Laura Ingalls Wilder and Emily's mom. Thanks for coming! Saturday night was the banquet. The menu was fabulous, as you can see. A server put my napkin in my lap for me. 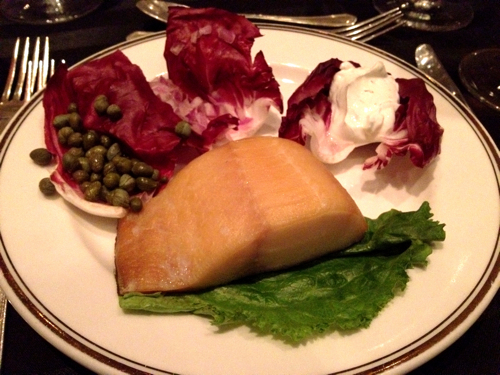 This smoked sablefish from Vital Choice was incredible. Just awesome. Especially with the dill sour cream. 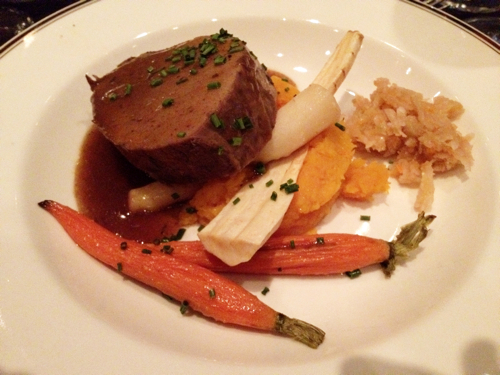 Pot roast with roasted veggies, kraut and winter squash. The banquet room was so dark…. sorry about the pictures. I couldn't fix it. 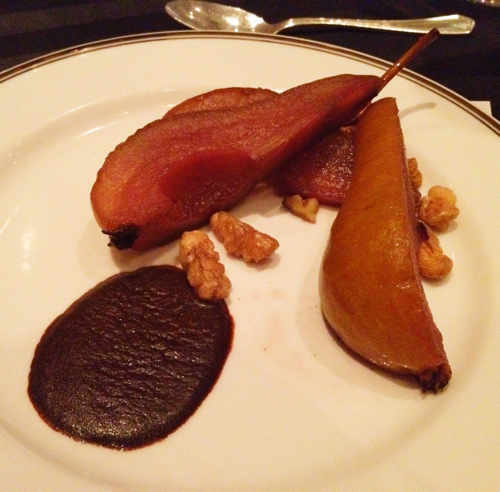 Red wine poached baked pears in cinnamon sauce. Yumm! Michael Schmidt (who recently ended a hunger strike undertaken in an effort to get an audience with governing officials in Canada) took the stage for just a few minutes to encourage us that in our fight for raw milk, we should let go of aggression because those on the other side are people just like us. Monica Corrado from Simply Being Well was the cook in charge of all conference food. She worked with the motel's chefs to make our meals using healthy fats and broth and other traditional foods. As a thank you, Sally Fallon-Morell gave all the new-to-traditional-cooking chefs a copy of her book, Nourishing Traditions. Isn't that awesome! I hope they will use it. Sunday morning…. worship. praise. prayer. Here's the lovely group (plus 3 more who had to leave) who gathered to honor our Creator, the author of nourishment and salvation. Thank you, Brenda, for organizing this! 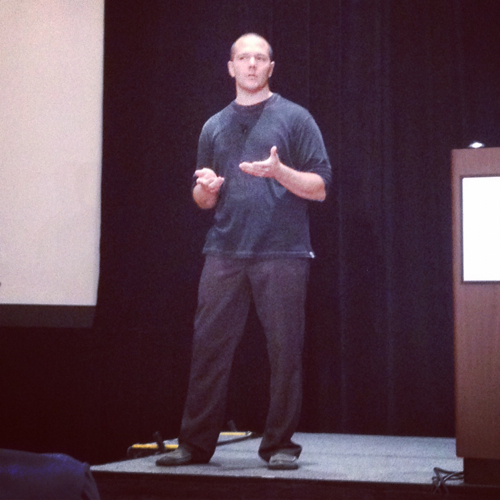 On Sunday, one of the sessions I attended was Matt Stone's (his blog is 180 Degree Health). 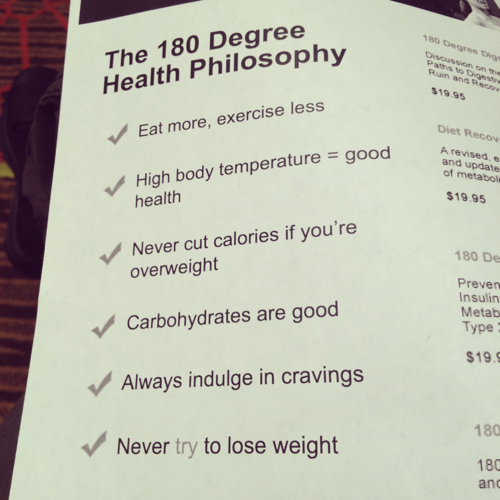 He shared his philosophy on health, which you can see below. Visit his blog for three video clips from his talk. Here's what I got from it… low body temperature (plus other symptoms) are signals of a low metabolism. Dieting and exercise (especially cardio) lower the metabolism and are usually not successful at weight loss. He says to destress, rest, eat (don't restrain or starve yourself), don't try to lose weight, etc. Feed your body so it is not in starvation mode or taxed. That will raise your body temperature and metabolism. Then once it is up, you should reap the benefits of health (such as weight loss, better health, etc). If that sounds both mind-blowing but intriguing, you should probably get his book on Diet Recovery. I did and I'm reading it now. In this photo, trying to visit vendors but ending up talking instead, are: Jami from Eat Nourishing, me, Adrienne from Domestic Diva, and Sherry also from Domestic Diva. 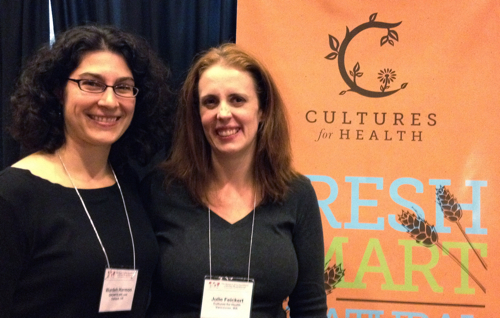 One of my highlights was meeting Julie from Cultures for Health. 🙂 Love ya, Julie! 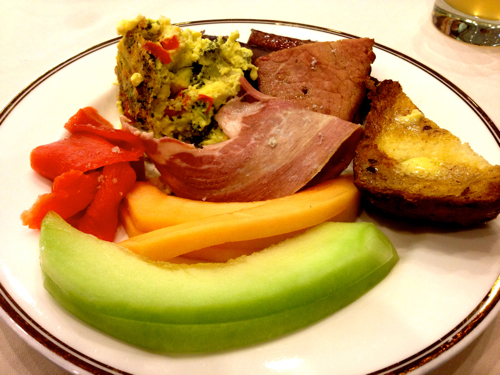 Our last official conference meal was Sunday brunch. There was soooo much food served. I was so full. Different meats — from sausages to ham, sliced lox (fantastic!) sourdough French toast, egg casserole, and Kombucha. The Kombucha was quite bubbly and it also was a lighter color. Later, Jami and I wondered what made it so. Ginger, perhaps? 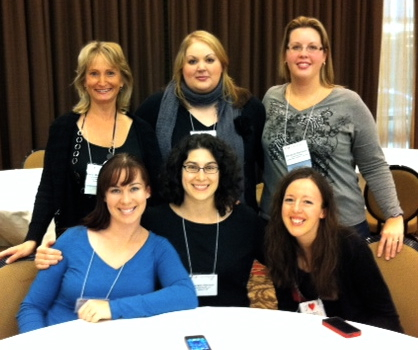 This group of bloggers played hookie one session on Sunday so we could talk. Don't tell anyone! (That's what conference recordings are for.) 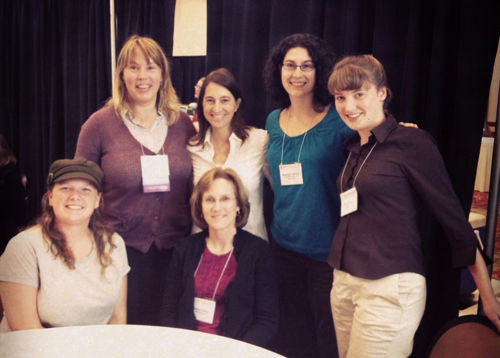 Top row, left to right: Kelly the Kitchen Kop, Amy from Real Food Whole Health, and Christine from Butter Belle. 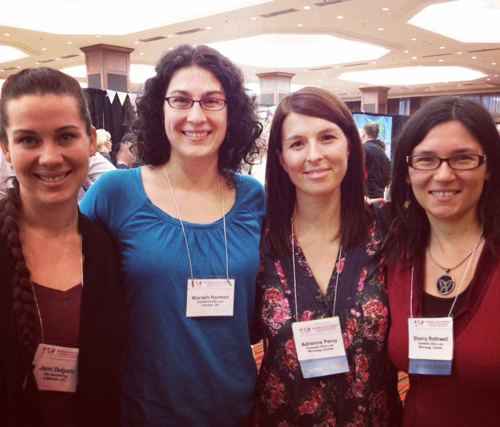 Bottom row, left to right: Jami from Eat Nourishing, me, and Brenda from Well Fed Homestead. I met alot more great, great people, too! Definitely a big reason why I wanted to go in the first place. The conference ended Sunday evening. The foundation worked with the motel to provide a traditional-foods-friendly optional dinner in their restaurant — lamb/lentil stew, kraut, salad, roasted Brussels sprouts, and roasted veggies. Among other things. When the waiter came up to pour our drinks, he said, “Would you like water or tea?” I said, “Is the tea…. ?” and before I could finish, he said, “It's your kind.” It was more of the rooibos — of course, I had it. I flew home early Monday morning (yesterday). My flight out of Dallas was delayed 2 hours because a flight attendant called in sick. I prayed and prayed that I would still make my connecting flight out of Salt Lake City to Eugene — and I did. With minutes to spare. Praise the Lord! I profusely thanked the flight attendant who saved the flight. I came home to a clean house and a happy family. A. texted me a few times to clarify directions for cooking and once to tell me that cooking was fuuuuunnnnnn (her words). The family did very well; I should leave more often. 😉 My plan for this week is to get rested by taking lots of naps and keeping things low-key as I can. For lots more conference insights of bloggers and tweeters worldwide, visit #wapfconf on twitter. You can also see my photos on Followgram or Webstagram, or visit my facebook page. It is good to be back! This was a painful post for a pregnant woman at dinner time! 🙂 Looks like an amazing experience and so much information! Shannon — Oops! Sorry. 🙂 I wish you could have been there. Wow! You really did a great summary of the conference here! I’m sure you’re glad to be back home with your family (I am too), but it sure was a pleasure to meet and get to know you. Wardee, I enjoyed following along with you on Facebook and was hoping that you would blog about your experiences once you got home. Thanks for sharing this with us! You’re going to love your new mop. Did you get the window cleaning cloth? I think it’s my favorite Norwex product. 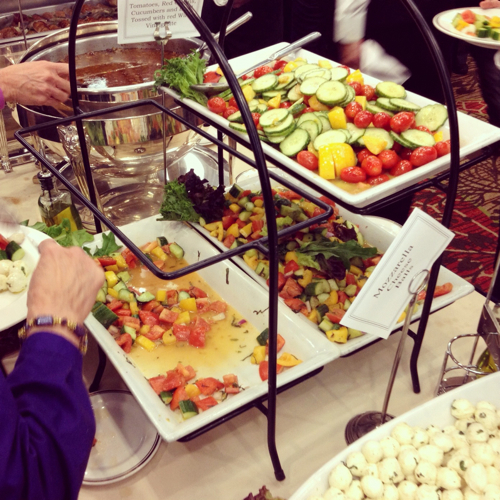 I’m amazed by the quality and quantity of food that they served at the conference. When I think of the logistics involved to produce sauerkraut, kombucha, and other ferments for that many people, my mind is somewhat boggled. Very impressive feat. Jennie — Yes, I got the polishing cloth, too! The quantity and quality of food was amazing. Many of the sponsors donated huge quantities of their foods to be incorporated in the meals. At the end, they had a yard sale from everything left over — yogurt to grains to butter to ghee to maple syrup to muffins to everything! Wardee I hope you get some rest….thank you for sharing your trip with us who wished we could’ve been there with you. So glad you got to go. I would love to go one year. 🙂 Thanks for all the photos and news. Marci — I hope you get to go someday! Thanks for sharing all of this, Wardee. I really enjoyed hearing all about it. The food sounds & looks great! So glad you got to go!!!! What a wonderful conference! 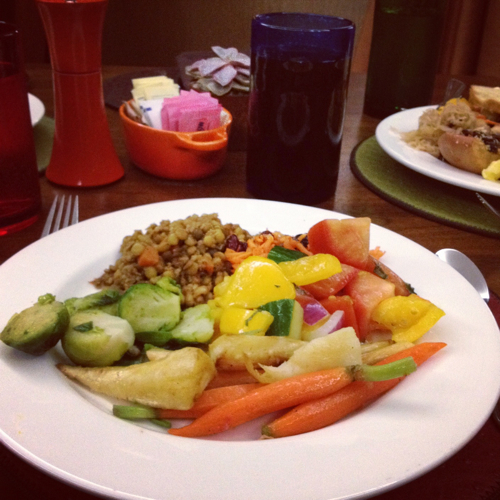 Thanks for sharing your adventures with us, and the pics of the food, oh my goodness! That breakfast bar looked fantastic 🙂 Yum yum. Thanks, Meg! The breakfast bar was the best part. Every morning I had a bowl of the yogurt with all the fixins’. Thank you for the great summary! I wish I could have been there this year. Next year is CA so it’ll be easier for me to make it. Do you think you’ll be going again? I went last year and it was so fabulous! I can’t wait to get the conference sessions on cd’s – did you have other favorites in addition to what you wrote? Lisa — Lord willing, I’ll be there! Everything I heard was really, really good. I’m getting the recordings so I can hear everything else. I didn’t get to go to any of the farming track and I heard those were wonderful. I’ve got a couple Norwex products, they’re very nice. Marg — You would have loved the fish and sour cream sans capers. 😉 Which Norwex products do you have? I got my mop yesterday — I am going to use it today. I’ve got the microfibre dusting cloth, and the glass cleaning cloth. I use them all the time. 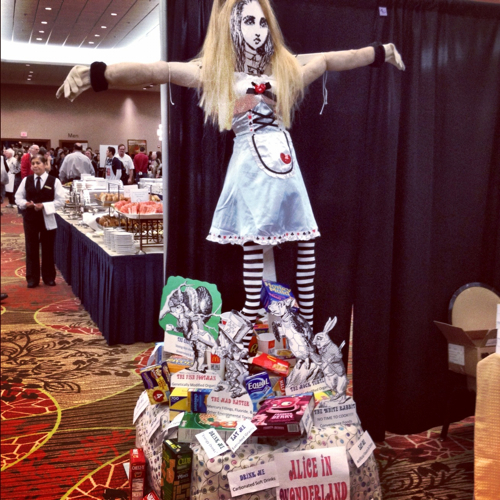 That is one pretty scarecrow and fascinating as well. 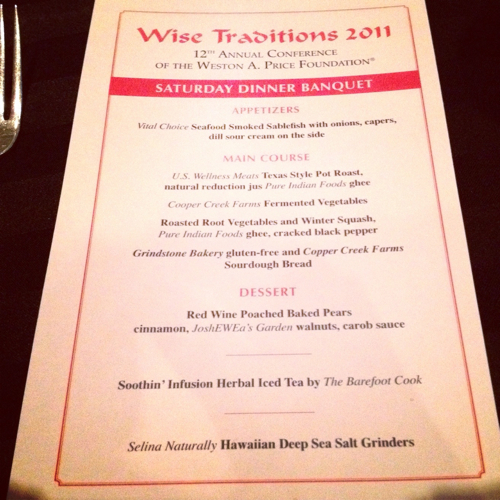 The event sounds excellent and food looks delicious. You took really nice shots of the event; it makes me wish I was there. Thank you for sharing. I am very interested in the book you bought after attending Matts workshop. Can you please keep us informed about what you thought about it. I totally trust your opinion. He cant be far out in left field because he was at the conference. Right? Thanks Wardee! I haven’t read Matt’s work but I did read what Wardee said about his presentation. I don’t know what else Matt says, but this part sounds spot on to me, and I have a personal experience. God provided a natural practitioner for me when I learned I had breast cancer over 4 years ago, and following his program, I was cured without surgery, radiation or chemo. My guy says the same thing as Matt — your body wants to live, and it needs fuel. Almost everyone’s thyroid is sub-par. It was incredible how I ate more (of the right things) and lost weight and got cured of cancer all at the same time! Kathy — Wow! Thank you for sharing your story. To God be the Glory! So enjoyed your posts on the conference!!! 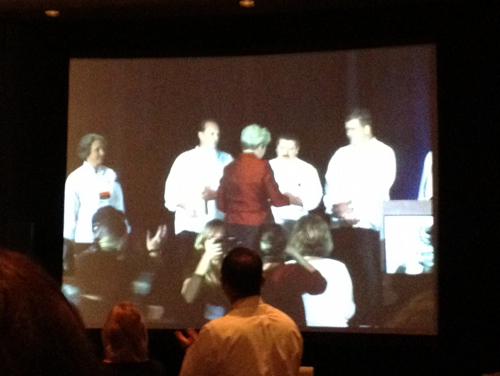 The coolest thing I think is that the chef/cooks were able to receive some pivotal teaching on healthy cooking. My prayer is that they are so very much inspired and impacted by the conference to incorporate this in their career! Hey! I was there also all I can say is WOW. this was my second conf and I love they way everyone slabs on the butter.You couldn’t even see what was under the butter! The farm tour was truly awesome. Looks absolutely amazing and fun! 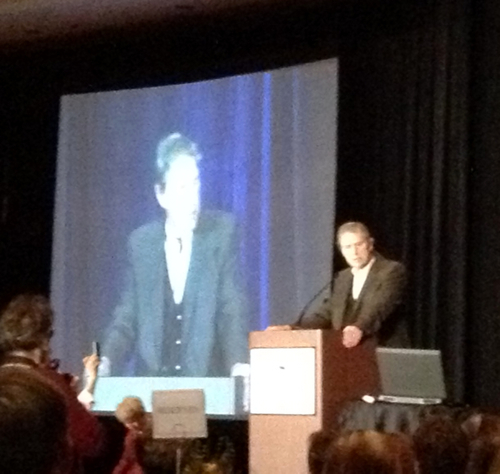 Hi Wardee- I was also at the conference and saw you from a distance. I was pretty busy with a seven month old and two year old, but I wish I would of at least said hi :). It was a lot of fun and so encouraging seeing all the people young and old that attended. Love see the recap of the conference! Megan — I wish we could have met! 🙁 Next year, okay? I also mention a smart phone app that Monica Corrado developed re: bean/grain prep. Love it! Julie — Thanks! I read your post and I’m going to look into Monica’s bean info plus the app. Thanks! Wardee, Thanks so much for summarizing the conference, I would have loved to go but since I couldn’t it’s so fun reading about all the great food, friends you met and made and what you found interesting in the talks!! !